Prior to the season, I was saying the Yankees should move veteran outfielder Brett Gardner. Now, fourteen games into the 2017 season, I am more convinced than ever he should be moved. 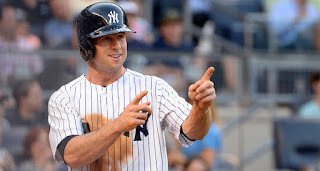 Granted, it is not his fault that he turns 34 on August 24th (I personally blame his parents) but he does not fit into the long-term view for the new and improved New York Yankees. For the season, Gardner is batting .205 with no home runs or RBI’s. He has stolen five bags but all things considered, his production is replaceable. The Yankees need to find room to consistently start fourth outfielder Aaron Hicks. Hicks, 27, has shown he can be a productive hitter when he regularly knows that he’ll be in the lineup. For the season, Hicks has much better numbers than Gardner (outside of the total stolen bases). Hicks has received 15 less at-bats than Gardner but only has two less hits. Hicks has three home runs on the year, with eight RBI’s. His two stolen base attempts ended in failure but regardless, Hicks has been the better player. Even though he hasn’t put up the numbers for AAA Scranton/Wilkes Barre-Barre this month, I think Mason Williams, 25, is a very capable fourth outfielder. I would love to unload center fielder Jacoby Ellsbury but with his contract, he’s not going anywhere. We’re four years into his 7-year, $153 million contract and at this point, there’s nothing he can do for redemption (at least not in my eyes). He is what he is, and he’ll never be more, and he’ll never be that dude who tore up the league for the Boston Red Sox in 2011. That was his Brady Anderson year. Chained to Ellsbury for the foreseeable future, it means that Hicks would need to play either left or right. Aaron Judge is the awakening Giant in right so he’s not going anywhere. That only leaves left field. It makes the most sense to move Gardner and begin the outfield youth movement with full intensity. Gardner’s been a good Yankee so slap him on the back, give him a watch, and send him on his way. I suppose the opposing point of view is that Ellsbury will be hurt at some point and it will be necessary to slide Gardner to center, creating a left field opening. At some point this season, the Yankees need to begin placing higher value in Dustin Fowler as the center fielder of the future unless they plan to discard Fowler (a mistake in my opinion) to make way for Jorge Mateo. I wish Mateo was closer to the Majors so that he could force a competition but at this point, Fowler will be ready much sooner. Since Mateo is still learning the position, he is much further behind Fowler than just levels in the Minor Leagues. I wouldn’t want to over-expose Matt Holliday but he could still play left occasionally in a pinch. As former Yankee Lee Mazzilli once said (regrettably), “Left field is a position for idiots”. Not trying to demean the position, but there are others in the organization that can play the position as back up for Hicks, Ellsbury, and Judge. There always seems to be fourth outfielders readily available as free agents or ones that could easily (and cheaply) be had. I am not worried about the outfield depth. As we move deeper and deeper into the season, guys like Clint Frazier move closer to potential callups. It’s time to move Gardy. Maybe not this exact minute but no later than July if not sooner. Now that I’ve ripped Gardner for the day, he will probably go on a hitting tear. Why is it that the best Yankees beat writers always move on? I remember loving the work of Peter Abraham on the LoHud Yankees Blog, and these days he is a Red Sox beat writer for the Boston Globe. I get it, he’s a Boston guy so it was an opportunity to go home. Then, I loved reading Mark Feinsand of the New York Daily News and listening to his podcasts. Now, he is a writer for MLB.com writing about, Egads!, other teams. Or Marc Carig of The Star Ledger moving from the Yankees to the Mets. Next, you’ll probably tell me that Brendan Kuty or Bryan Hoch have found other things they’d like to do. Sorry, just my rant about losing Feinsand. I enjoyed his time as the Yankees beat writer for the Daily News. The win streak ends at eight. Bummer. Usually, when a starting pitcher goes eight innings and only allows three hits and strikes out ten, the end result is a win. But on a night when the other team’s starter was a wee bit better and the Yankee bats were quiet, Luis Severino took the loss as the Yankees fell to the Chicago White Sox, 4-1. The Yankees had a chance at the end with the winning run at the plate, but Aaron Judge grounded into a force out to end the game. A grand slam would have been so cool at that moment. The Yanks still have the chance to take the series when the teams meet for the third and final time this evening. Tuesday evening turned out to be a double loss as top prospect Gleyber Torres was scratched from the lineup for AA Trenton Thunder due to biceps tendonitis. He will undergo a MRI to determine the extent of the injury. Hopefully, the news will be favorable. James Kaprielian underwent successful Tommy John surgery on Tuesday, so now the long road to recovery begins. Have a great Wednesday! I think it’s time to start a new winning streak! I 100% agree with this article. If the opportunity is there to make a move do it and don't worry or be blinded by team chemistry because Hicks will fill in and a younger kid will be brought in and create there own chemistry on the team.